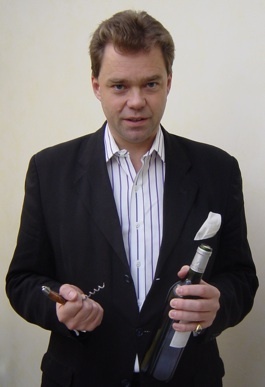 From the ashes of a chaotic opening hour at yesterday’s Whisky Live event in Dublin I managed to pluck a few Phoenixes in the shape of some wonderful Irish whiskeys. I started at the Mitchell’s stand where the ever-genial Peter Dunne was pouring Green Spot from the new, slightly dumpy, bottle. The label has changed too, and I am not sure if it is for the better, but the whiskey remains delightful, honeyed and spicy, clean and comforting. 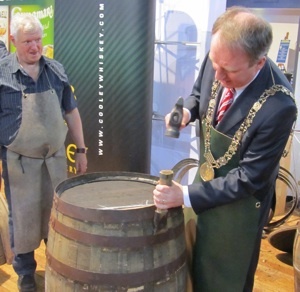 Lord Mayor of Dublin, Gerry Breen, tries his hand at barrel making. Next was a long overdue catch-up with Ally Alpine of the Celtic Whiskey shop on Dublin’s Dawson Street. His stand seemed to stretch halfway around the room and it was laden with every manner of treasure for the whiskey connoisseur. Two Connemara malts were tasted side by side, one finished in a bourbon cask and the other in an amontillado sherry cask. For me it was no contest. 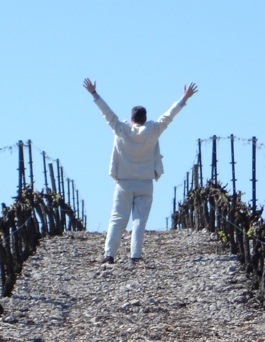 The former was vivid and intense with multiple layers of flavour while the latter seemed to be too much of a good thing, with an unnecessary overlay of sherry flavour on top of an already replete palate. If a flavour can be described as ‘Baroque’ this is it. Finally, a stop at the Cooley stand where the Lord Mayor of Dublin, Gerry Breen, was being instructed in the finer points of barrel making while enthusiastically wielding a dangerously heavy hammer. Meanwhile, Jack Teeling was pouring an 18-year-old Kilbeggan whiskey whose flavour was gorgeously riotous on the palate. Waves of spice and vanilla competed for the taste buds’ attention before departing on a long, lingering finish. Make mine a double!